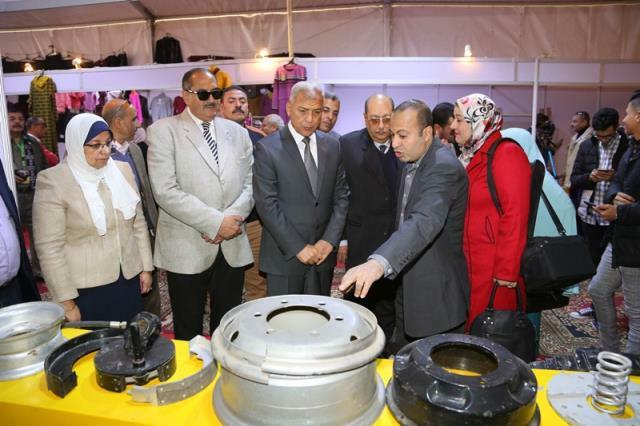 The Minister of Social Solidarity, Mr. Adel Abbas, Advisor to the Minister of Social Solidarity for Marketing, opened the exhibition of cooperative and service cooperative products organized by the Directorate of Social Solidarity in coordination with the Central Production Cooperative Association at the Sports Stadium in Shebin El Koum city in the presence of Major General Alaa Yousif, Assistant General Secretary of the Governorate and General Mohamed Naim, Former Minister of Social Solidarity and Amani Ghoneim, Undersecretary of the Ministry of Solidarity for Social Development in the Ministry and Accountant Ahmed Zuhair, Chairman of the Cooperative Production Union, Kom and a number of members of the House of Representatives and agents to maintain the ministry. Amani Al-Naderi confirmed that the exhibition will be held on 400 meters and will last for one week from 10 January to 17 January 2019. It includes many high quality products at cost prices from 7 governorates (Cairo, Giza, El Gharbeya, Dakahlia, Qalioubia, Damietta, Menoufia), which consists of displaying handicrafts, wooden products, furniture, furniture, pendants, ceramics and pottery, as well as various leather goods, as well as ready-made garments and carpets. Al-Nadri added that the aim of the exhibition is to market handicraft products, encourage producers especially young people and develop small enterprises to preserve heritage products and crafts. For his part, Major General Said Abbas, Governor of Monofia, to provide all the support for the owners of small projects and handicrafts, which is famous for some villages in the province of ceramics and shellfish directed by the Undersecretary of the Ministry of Social Solidarity to study the duration of the exhibition for another week in coordination with the Undersecretary of the Ministry of Youth and Sports in the province to ensure the greatest time It is possible for young people to market their products. He also directed the establishment of a permanent exhibition in Shebin El Koum to work to nurture youth and create new markets to market their products, develop their small projects and provide job opportunities to fight unemployment.